You Are Invited to Bonita Blast! 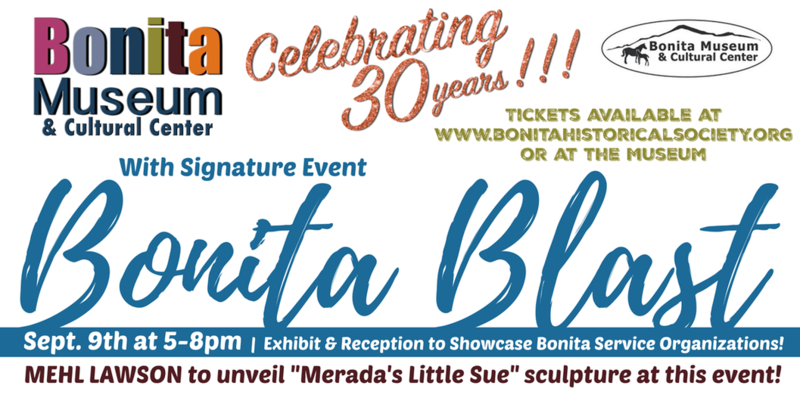 Join the Bonita Museum and Cultural Center, September 9th at 5pm, for a special event and fundraiser showcasing organizations that have aided in the growth of the Museum and the Sweetwater Valley community. A reception will be held with BBQ and great food catered by Savor, the band Coolrays, live and silent auction, dancing and much more fun. Also, Mehl Lawson will unveil the sculpture “Merada’s Little Sue”. Hope to see you at this great event. Tickets are selling fast!